What is your reaction towards combining watermelon and feta cheese combo? 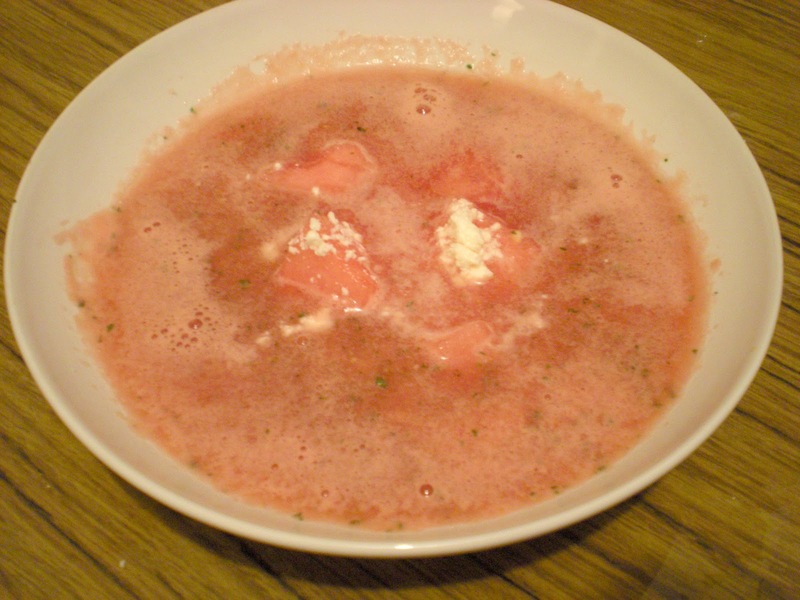 When my labmate was mentioning that he was going to make watermelon feta soup for the Red & White cooking theme, I was unsure if the saltiness of the feta cheese would match the taste of the sweet juicy melon. He did convince me that it is the best soup he had ever tasted so approve it. When I think of it, the watermelon-feta combo is also employed in Greek salad so the soup should not be too bad after at all. It might be a bad time to post this recipe as there are several feets of snow outside right now and Christmas is arriving soon. If you want to feel like summer again, this is for you. 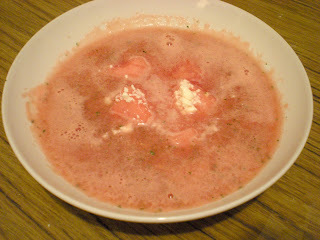 It is cold and refreshing with a fresh herbal taste of mint and the salty feta cheese balances well with the watermelon. The recipe is adapted from Epicurious, but we did not add any sugar as our watermelons are already sweet. 1. 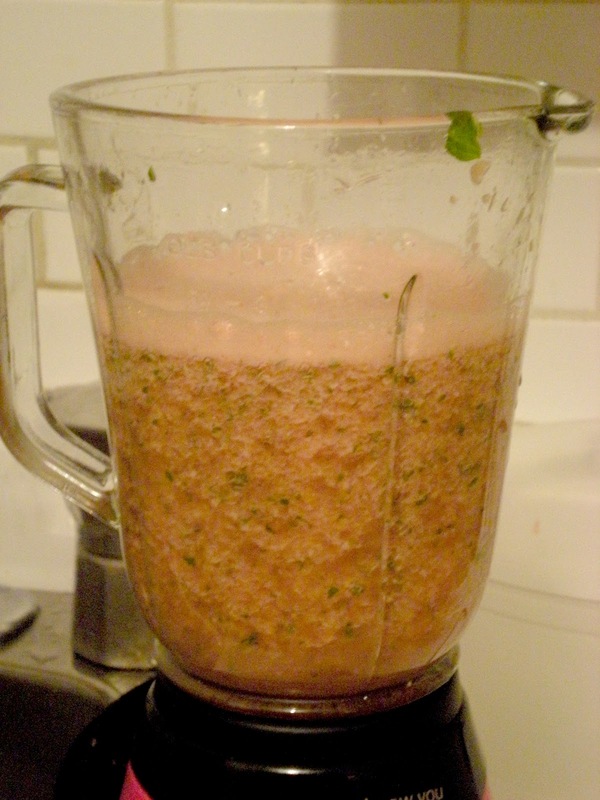 In a blender, combine 8 cups watermelon, mint, lemon juice, wine, sparkling water. Blend until smooth. 2. Strain soup and divide into soup bowls. Top each bowl with reserved watermelon and a teaspoonful of feta cheese. Serve. I've had watermelon and feta together as a salad which I thoroughly enjoyed. But combined in soup, now you are daring me to give it a try. Wow wat a beautiful looking soup, yummy..
What a delicious sounding combo of flavors! Wow, this sounds like a delicious and amazing combination. You had me at feta! Here in New Zealand they make a lot of watermelon and feta salads, never seen it as a soup. Me? I am so used to watermelon as a fruit snack... I'll rather do cucumber and feta soup ;-), but after all they are of the same family!